Kind of shops This theme is custom-made for medical, medical equipment, medical instruments, medical supplies, hospital supplies, doctor tools, and business & services websites. 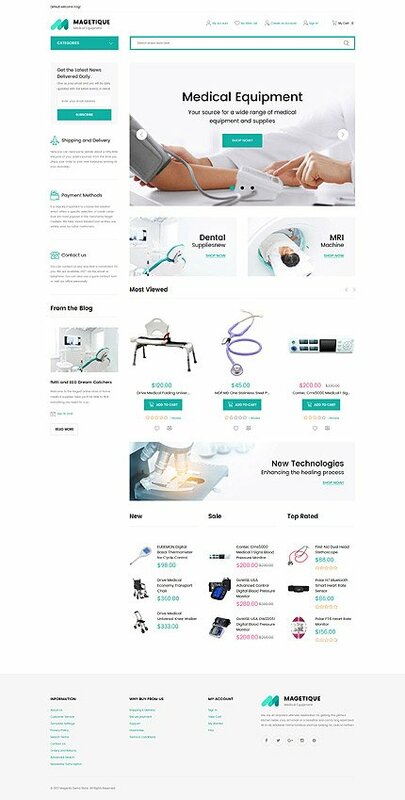 This fully responsive and SEO-friendly theme is a child of our outstanding Magetique, so, you can easily build a top-notch medical equipment store using a large number of pre-loaded features! Make your medical supplies products look catchy with star rating, Product Carousel, and crossed pricing. Special Price Countdown will help you to capture your clients, while Wishlist & Compare plugin will help them to lay aside necessary hospital supplies items and to compare them to find the best one. Ajax Cart will help your customers to check their purchases without relaunching the page, while an Advanced Search will help them to get speedy search results by means of keywords. Sell medical equipment as a pro with this doctor tools theme! Can I use graphics from Magento ecommerce theme for Medical Doctor I purchased for use in printing? After Emergency Ambulance Magento theme purchase you can put your copyright to the template. But you cannot place a line at the bottom (or any other spot) of the customized project saying "Website design by Company name". Nevertheless, you can place "Customized by Company name".